The ExpertSDR2 software package is user friendly yet very capable. It has a intuitive and clear layout and most used functions are available for easy access via buttons and sliders. The software demodulates all basic types of signals like USB, LSB, DSB, CW, AM, Synchronised AM, Narrow FM and Wide FM and any other mode can be decoded using thirds party software using virtual audio and serial connections. Expert SDR2 provides you with two independent receivers that each can sample a user selected bandwidth anywhere in the HF spectrum. Each receiver has its own SUB receiver providing a total of four simultaneous receiver slices. Both receivers can be independently controlled by separate serial connections to create a SO2V or SO2R* experience in loggers like N1MM and WinTest. An additional band scope allows for visually skimming bandwidths up 80 MHz bandwidth in a single display. This band scope can be open at the same time as the two main receivers allowing for quickly check band activity in other bands. Its also provides a good spectrum scope when checking the purity of other transmitters or checking the effectiveness of band pass filters etc. The DSP functionality developed by Expert Electronics provide many efficient ways to improve reception and transmission quality. In addition to the features you expect you will find some have creative DSP futures like the APF, Audio Peak Filter, helping you to dig marginal signals our of the noise. And the DSE, Digital Surround Effect, creating a surround effect by panning CW signals left and right to help your brain pulling out a single call from a pileup. 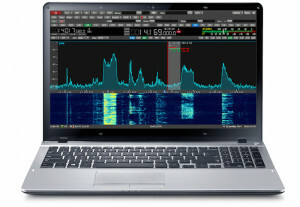 The ExperSDR2 Remote System is a server/client based version of the software allowing for a full SDR experience via the internet supporting DSL and mobile data connections via 4G and 3G. Supported operating systems: Windows XP, Vista, 7, 8 and 10. Linux Ubuntu and Kubuntu. MacOS support is planned at a future date. The program will work on less powerful PCs with Core2Duo and Dual-Core processors, but performance and functionality might be reduced. ExpertSDR2 is a free download, find the right version for your radio and operating system website SunSDR.eu here. Read more about the Expert Remote System at out sister website SunSDR.eu here. * Some features planned to be supported in future updates of the software. For more information on specific features please contact info@sunsdr.eu.